Laser technology has been proven effective for a wide variety of cosmetic procedures. One of the most useful applications is laser resurfacing for scar reduction. Studies have shown that laser treatment can reduce the appearance of scarring by up to 60 percent. When seeking effective treatment for scar reduction, Edgewater and Hoboken area residents are turning to the services of Dr. T.G. Khan, a board certified physician and surgeon who specializes in the use of cosmetic laser technology. 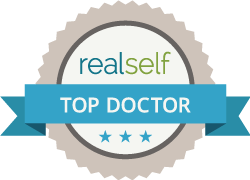 As Medical Director of Edgewater and Hoboken Cosmetic & Laser Centers, Dr. T.G. Khan is one of the premier providers of CO2 laser treatments for skin rejuvenation and scar reduction on the face and body, specifically with the DEKA SmartXide® DOT Laser. What technology is used in Scar Reduction Therapy? DOT (Dermal Optical Thermolysis) Therapy uses the SmartXide DOT CO2 laser to treat scarring caused by sun damage, acne scars and other skin injuries. It’s also used to treat fine lines, wrinkles and loose skin. It offers the advantages of accurate results combined with minimal downtime and rapid healing. DOT Therapy has minimal side effects and recovery time and allows multiple issues to be addressed in a single treatment using little or no anesthesia. The controlled, customized laser used in DOT Therapy sets a new standard for skin rejuvenation. Prior to the procedure, Dr. T.G. Khan will apply a topical numbing cream to assure you complete comfort during your treatment. During the procedure, tiny laser pulses are applied to the skin in a controlled pattern. The procedure will be customized for your particular skin condition. Application of the laser will be continually adjusted throughout the procedure to target specific areas, such as acne scars on the cheeks and wrinkles around the eyes, mouth, neck chest, and even the hands and arms. Unlike the strong CO2 laser treatments of the past that covered a larger area of the face or body and required a much longer recovery time, DOT Therapy is applied in tiny laser pulses forming “dots” of treated skin intermingled with areas of spared skin. The SmartXide DOT Therapy CO2 laser works through the creation of these microscopic perforations in the skin, stimulating skin tightening and the production of new collagen. The untreated areas of skin facilitate the treated areas to heal faster, significantly reducing side effects and redness, and maximizing results and effectiveness. Patients are pleasantly surprised by the tightness of their skin following a DOT Therapy session. The skin’s tone and texture is improved at the same time that the appearance of scars is decreased. You’re left with smaller pores and clearer, tighter, smoother skin in a matter of just a few days. Why should I go to the Edgewater and Hoboken Cosmetic Center for Scar Reduction Treatment? Hoboken and Edgewater residents and all patients seeking this great technology can schedule a consultation with Dr. T.G. Khan, whose experience and background qualify him to recommend the best course of treatment for a wide variety of skin conditions. Call Edgewater and Hoboken Cosmetic & Laser Centers at 201.313.8899 today. There’s no reason to live with skin scarring that can be effectively treated with state-of-the-art laser technology backed by years of laser experience.